Leigh Olsen recently added a 2007 Leopard 43 Powercat to his collection. Two years prior, Leigh had Glidecoat's Nano Ceramic Coating applied to his Coastal Bay. He was so happy with the results on his 2005 Coastal Bay, Leigh contacted us to apply our ceramic coating to his newest boat. Owning a large boat has its major advantages, giving you the freedom to take long trips in comfort and style. These boats also provide unique challenges, and the major challenge for boats that remain in the water is ongoing maintenance. Keeping your boat clean can be a tall task, especially when you can't properly wash the hull. These factors make it even more important to give your yacht or boat the proper protection, making maintenance as simple as rinsing down with water! Leigh's boat is no exception. "Sea Nanignas" is a 43 foot catamaran, with a painted deep royal blue hull. Cats provide a great ride through the water, but they also have two hulls to maintain. "Sea Nanigans" is based in Key West, Florida, and she stays in the water all year long. Leigh wanted his boat to look great, but he also wanted to reduce the amount of time and effort cleaning his boat, especially the hull. That's why he returned to Glidecoat! 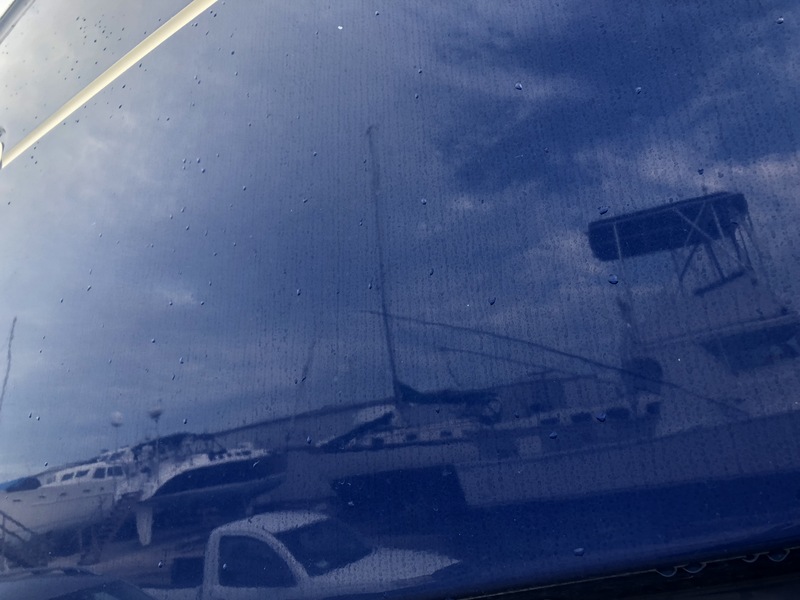 We began the process by washing the boat with Nano Wash, a non-abrasive soap, to clean the surface before buffing. 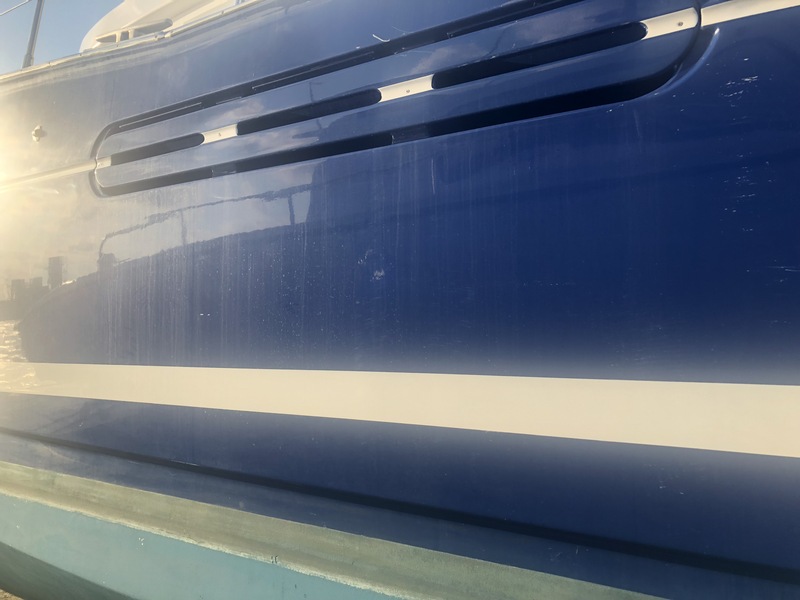 The blue hull and white gel coat on the top side were in relatively good condition, but many areas suffered from hard water marks and oxidization. 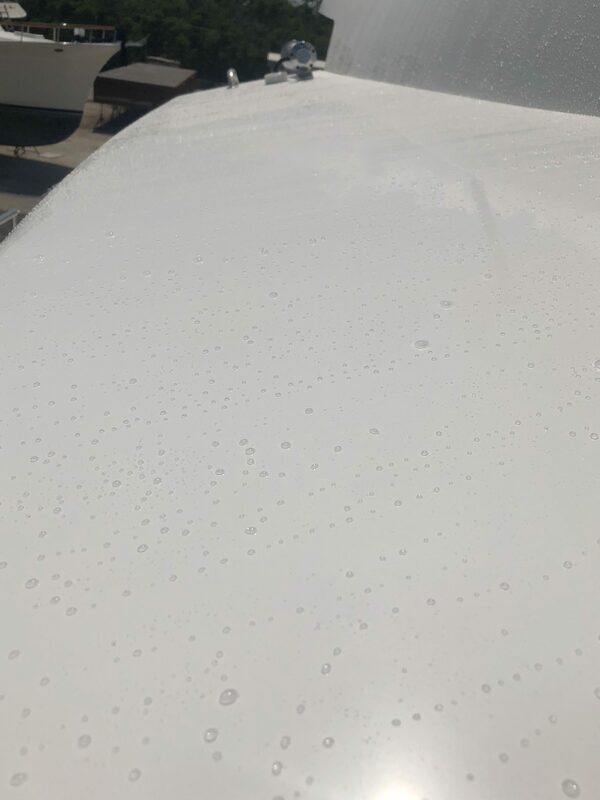 In order to correct this problem we went through a three step buffing process, including Glidecoat's Heavy Compound, Nano Compound (medium cut), and Nano Polish. The first buffing step, heavy compound, we used a rotary buffer with a clean wool pad to remove all water marks and oxidization. We then moved to Nano Compound with a foam pad to begin to smooth out the surface and restore the shine. Finally, we finished off buffing with a clean foam pad and Nano Polish to bring out more shine and ready the surface for our Nano Ceramic Top Coating. Before beginning to coating process, we decontaminated all areas to be coated with Glidecoat's Surface Wipe, removing any dirt and residue. Now we are ready to apply the final coating. We start by pouring a dime sized amount of coating onto the red application sponge. Working in 2’ by 2’ sections, we apply Glidecoat's Nano Ceramic Liquid Crystal onto the surface. When applied the surface will appear to be “sweating”, we then buff the area with a clean microfiber cloth, working the coating into the pores while removing any excess liquid from the surface. This process is completed across the entire boat. Once the first coat is completed, we repeat this step and apply a second coat of Glidecoat's Nano Ceramic Liquid Crystal. 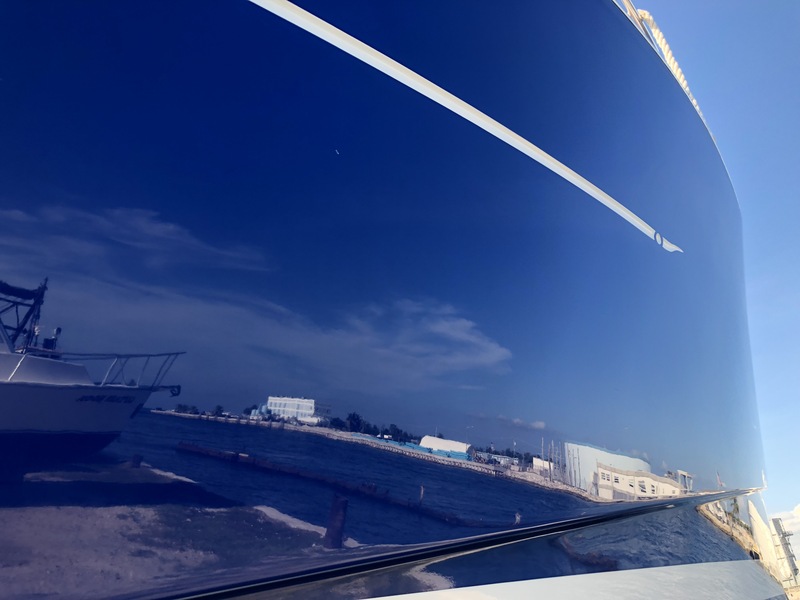 Two coats of Glidecoat's Nano Ceramic Coating were applied to the gel coat and hull, restoring the color and shine. I did not think it could ever look that good. Before beginning our process the gloss meter readings ranged from as low as 32.3 to 63, after completing our process the gloss meter readings hit an amazing 92 which is better than new! The outcome of this project shows not just how the product restores the appearance but also how it changes the surface to a super smooth easy to maintain condition. Glidecoat's Nano Ceramic Top Coating restored a deep gloss to the royal blue paint, giving a better than new gloss and shine! Close up of the hydrophobic surface after Glidecoat application.